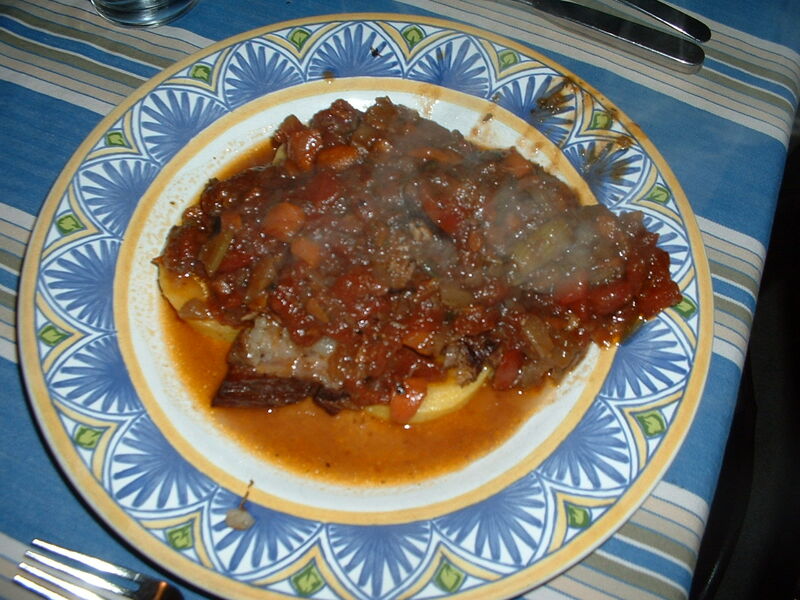 Rick’s Oven-Braised Straccato (Pot Roast) over Polenta | When I Survey . . .
2 cups beef stock plus more if needed. This is basically a pot roast. Eliminate the tomatoes and garlic, substitute dried thyme for the sage, add a bay leaf, and you have my basic pot roast recipe. That one I would serve over mashed potatoes, but this one I like over polenta. A straccato is a regional Italian pot roast, and this is my take on it. Let’s call it a North Jersey pot roast! This is easy but takes a bit of time, which is what braising is all about. I cook it all in my cast iron Dutch Oven, but you could do it in any fireproof pot that can go from the range to the oven. You can also cook the whole thing on the range top, but I like the even heat of the oven. I made this yesterday, put it in the oven at 4 p.m., went and had my daily nap, and it was all ready to eat by 6:45 (it needs to sit for a bit). Even better make it the day before, slice the cooled meat, heat up the sauce, and you are ready to go. Pre-heat oven to 325 degrees F. Heat the oil over medium high heat and swirl it around until it covers the bottom. Dry off your roast with paper towels (it won’t brown if it’s damp) and sprinkle it liberally with Kosher salt and freshly ground pepper. Then using tongs, or two wooden spoons, put it in the pot and brown it on all sides (don’t use a fork, because it will release the juices and you want them in there,). Depending on your heat this will take between ten and twenty minutes, but the trick is to get it a very dark brown without burning it, so pay attention (which is what good cooking is all about). 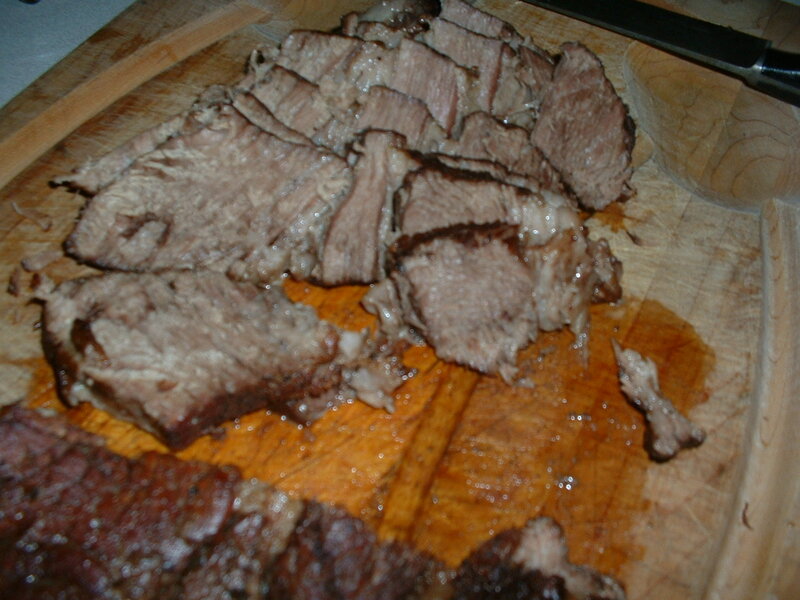 When the roast is nice and brown, take it out and put it aside on a plate, and reduce your heat to medium. Put in your chopped onion, carrot and celery, and stir with a wooden spoon now and again until the veggies are also nice and brown (but not burnt! ), about ten minutes. Add the garlic cloves and cook for another minute or so, then add you wine, beef stock, herbs and tomatoes and bring to a boil. Then lower heat to a simmer and, stirring occasionally, let it cook for about ten minutes. Then lower the meat on top of the veggies. The braising liquid should come about half way up the meat. If it doesn’t add more stock, but don’t put too much liquid in, because you want to braise it and not boil it. Bring it back to a good boil, put the lid on it, and put it in the oven. A 325 degree oven will typically keep a simmer just about right for braising, though you may need to adjust your heat according to variations in your oven temperature. You want to cook this for about 2 and 1/2 hours total. After about an hour, check the pot, lower or raise the oven temperature if needed and flip the meat over. If the liquid is low top it off with some more stock. After two and one half hours, check the meat. It should be nice and tender but still firm enough to cut. Put it on a platter, tent it with foil, and let it sit for fifteen minutes. While the meat is cooling, put your braising liquid on the range top and simmer it to reduce the sauce a bit, stirring now and again. Remove the parsley sprigs, taste and season for salt and pepper. Slice your meat against the grain and plate it over the polenta or mashed potatoes, then ladle the sauce generously and enjoy. We had this with steamed brussel sprouts last night for a hearty winter meal, but a green salad would work fine. A dry red wine will be just right. We drank a Masciarelli, a nice inexpensive Montepulciano d’Abruzzo, that is our current house red. This makes a nice, pretty easy, meal on a cold winter night that will be a crowd pleaser. >You're making me hungry. I'm planning on giving this one a go with some good Kiwi beef and an afforbale bottle of local Pinot. >Jason,I've been hearing good things about NZ Pinot Noir. Can you recommend one that might be available here? I love Burgundy (which is crazy pricey), but have for the most part been lukewarm about New World pinots.But this is a humble dish and a good local pinot sounds like just the thing. >Rick, you might like to look out for Two Paddocks, Olssens, Akarua, Mt Difficulty and Carrick. All great wines.